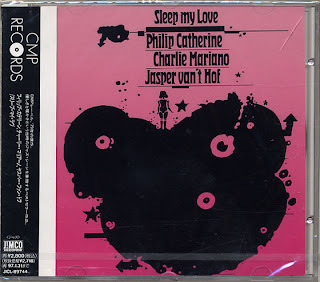 Jazz Station - Arnaldo DeSouteiro's Blog (Jazz, Bossa & Beyond): CD of the Day - "Charlie Mariano, Philip Catherine & Jasper van't Hof"
CD of the Day - "Charlie Mariano, Philip Catherine & Jasper van't Hof"
A personal favorite among the dozens of Mariano's albums in my collection, since I got the original German LP release, reissued in Japan by JIMCO. 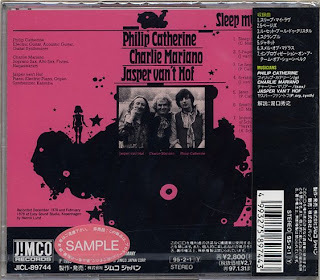 Recorded in December 1978 & February 1979 in Copenhagen, produced by Kurt Renker, it's an outer-space session on which Charlie plays flutes, soprano & alto saxophones, and the exotic nagaswaram, while Catherine uses acoustic & electric guitars and even a proto guitar synthesizer, and Jasper van't Hof plays acoustic & electric pianos, organ, synths & kalimba. Mariano contributes with the title track and "Smell of Madras", but shines throughout the album, which closes with a beyond words "Improvisation on a Theme of Schoenberg's 'Verklärte Nacht'".